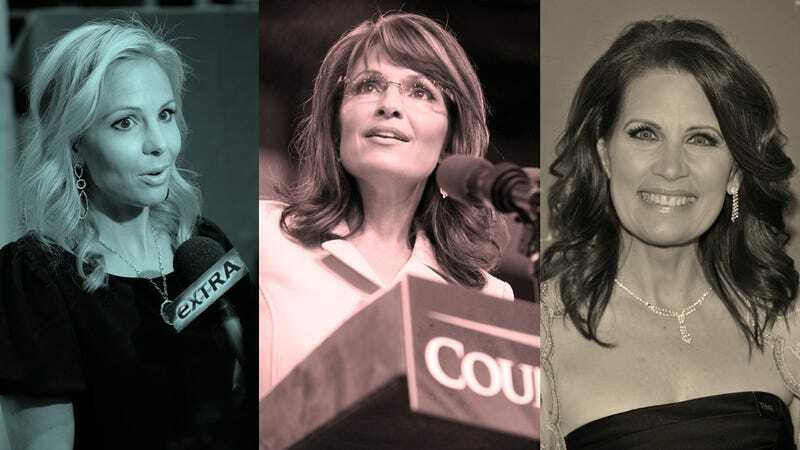 Two high-profile conservative women—Elisabeth Hasselbeck and Michele Bachmann—have reportedly not only distanced themselves from Sarah Palin, but are actively speaking out against her. Sort of, in their own tip-toey political ways. Sarah has not been serious over the last couple of years. She got the vice presidential thing handed to her. She didn't go to work in the sense of trying gain more substance. She gave up her governorship. He has a point, but Bachmann has said, as recently as last week, that she considers Palin a friend and not a foe. Seeing as how Rollins is a political strategist hired to help Bachmann with a potential bid for the presidential race, he might just be setting the stage a little early to help Bachmann have the advantage when it comes to the Tea Party's two favorite ladies. In more surprising news, there's a rumored feud between Palin and her onetime cheerleader Elisabeth Hasselbeck. According to pop-culture gossip site Pop Eater, The View co-host, who, during the 2008 election, campaigned for Palin and the governor-turned-reality-star haven't spoken in months. A "source" says that Palin stopped returning Hasselbeck's calls, which has lead to Hasselbeck lashing out at Palin during Hot Topics segments on The View, accusing Palin of "'manipulating' the media to draw attention away from the more-serious Mitt Romney, and mocked her ex-friend's bus tour as another attempt to dominate the headlines." If I had termites in my house, I'd get someone in there who could deal with it. Mitt Romney, right now, his specialty is the economy. I'd have him in there. Here's why we're not hearing it: because Sarah Palin's on a bus, and right now she's manipulating, in terms of media attention. The gossip item also cites Hasselbeck's March 2010 criticism of Palin's "crosshairs" imagery—nearly a year before congresswoman Gabrielle Giffords was gunned down in Arizona—as one example of Hasselbeck taking a swing at Palin.